It counts legendary Vancouver archivist J.S. Matthews among its first members. Historian Margaret Ormsby and provincial archivist Dr Willard Ireland were early speakers at gatherings. But now the Burnaby Historical Society is disbanding, as the membership has dwindled to 14 people.Many older members died or moved away, and like many non-profit groups in B.C., the society has not been successful in attracting younger people. 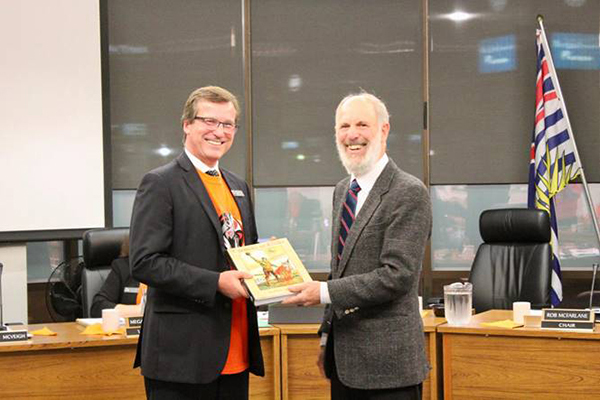 The Langley Heritage Society has recently donated copies of the book, Canucks in Khaki: Langley, the Lower Mainland and the Great War of 1914 to 1918 to every school in Langley School District 35. Cathy English speaks to a crowd in Revelstoke at the 2016 BCHF annual conference. Curator Cathy English and her team at the Revelstoke Museum and Archives are telling the stories of the communities forced to leave their homes when the valley was flooded in the 1960s with the creation of the Hugh Keenleyside Dam. The exhibit called Stories Beneath the Surface opened Oct. 18 and will be in place for the next five years. The exhibition features a touch-screen display with an interactive map where visitors can dive in and explore the rich history of the valley before and after flooding. This map is also available on the museum website. Listen to Cathy speak about the exhibition on CBC’s website. A referendum held last month by the Regional District of North Okanagan on a new cultural centre passed 7,850 to 5,367. Voters were asked to decide whether they support borrowing up to $25 million for the construction of a multi-purpose cultural centre in downtown Vernon. Read more in the Vernon Morning Star. Awards: Know of work worth recognizing within BC's historical community? We are accepting applications for the following BC Historical Federation Awards until Dec. 31. Prizes will be awarded at the BCHF annual conference, in Courtenay and Comox, June 6-9, 2019. Best Historical Website Award – For websites about BC history ($250 prize). News and Media Award – For resources published by CHF Member Societies ($250 prize). Historical Writing Competition – For authors of books that contribute to the historical literature of BC (several prizes of $500 to $2,500). Grants: We are now accepting applications to our Centennial Legacy Fund. Established in 2017, the fund supports projects that encourage historical research related to the history, communities and diverse peoples of BC. Applications to the fund are accepted annually until Dec. 31. Library and Archives Canada recently announced the launch of the 2019-20 funding cycle for its Documentary Heritage Communities Program. Since this program was introduced in 2015, 130 organizations have taken advantage of the financial assistance provided to enhance their capacity to sustainably preserve, share and highlight Canada’s documentary heritage. Every dollar invested helps to increase awareness of and access to local and regional histories that should be known and told across the country, not only in the communities where the projects originated. Eligible libraries, archival centres and other memory institutions can now apply for a portion of the $1.5 million that will be allocated in 2019-20. The Program’s eligibility criteria and guidelines are posted on the Library and Archives Canada website.